So what's been going on behind the scenes late May and early June? TB: On a short vacation from work. 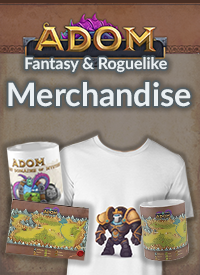 As we all know by now ADOM is obviously not work, so things are getting done ;) Mostly wrapping up crowdfunding loose ends, like physical rewards. 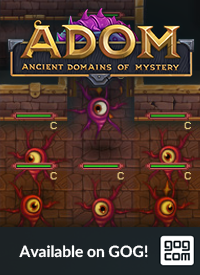 (ADOM Boxed Set anyone?). Zeno: Focusing mostly on UI. Added easy to use mouse controlled targeting, also looking at the few remaining ASCII main menu screens. Lucas: Music! Updating some older tunes and preparing a slew of new ones to match the upcoming content updates. 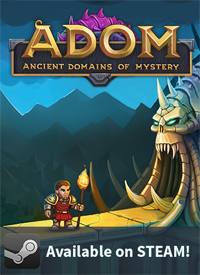 Will anyone of you be able to look into long-standing ADOM issues? At least into famous "illegal bodypart" and items stacks displayed two times in 'l'ook mode? Yes, I know that's one of the big bugs I have ran into when playing. I thought it was addressed before, but I guess not. Hopefully the bug fixes come out faster after getting that GIT stuff set up.